Looks like online car rental companies are hot right now – In last 6 months alone more than 5 startups in similar space have raised funding. 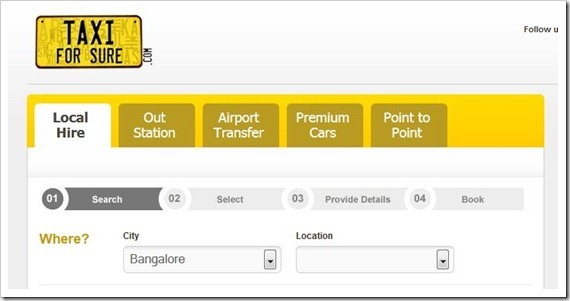 Taxiforsure.com, the online taxi booking service run by Serendipity Infolabs Pvt. Ltd., is the most recent one to have done so. They have raised venture capital funding from Accel Partners, Helion Venture Partners and Blume Ventures. As part of the transaction Anand Daniel of Accel and Ritesh Banglani of Helion have joined the board of the company. The company did not disclose details of the financial transactions. Taxiforsure.com is currently operational only in Bangalore and this venture funding is expected to help them expand across other cities in India. According to their website,Taxiforsure plans to offer wide range of choices to travelers which includes chauffeur driven, self-drive car rentals and radio taxis across India. Taxiforsure.com does not plan to have its own fleet of cars, but have network of taxi providers under their umbrella. They will tech-enable and bridge the gap between consumers and local taxi providers. Travellers need to follow 4 stage process on taxi4sure site – Search, Select, Details and Pay for booking pre-paid taxi service. They can also call their helpline number @ 080 – 6060 1010 (sixty-sixty-ten-ten) and do the taxi booking. Travellers can also directly make the payment on the website using following payment options – Credit card / Debit card / Net banking/ Cash card or they can directly pay cash to the driver during the time of travel. As mentioned earlier, online cab booking services are on the rise. Taxiguide, Olacabs, Savaari and YourCabs.com have all raised funding in past few months alone. With Taxiforsure also joining the pool this space seem to be getting crowded. There are atleast 3 other startups in similar space who are also looking for funding at this point of time. Would love to know from readers – Does this space have room for so many operators / aggregators? "Taxiforsure.com raises funding from Accel, Helion & Blume", 5 out of 5 based on 1 ratings.